Several people have written to me about bed thwacking, explaining that this is a traditional practice in their country. I found your bed thwacking article quite interesting. This is basically what happens traditionally in Japan on a daily basis. Futons are usually hung out on the balcony in full sun and at the end of the day are whacked with bamboo whackers, and the dust flies. My Japanese husband says that the sun gets rid of bacteria, germs, etc. Sadly for us a 3-storey house was built just behind our home and we no longer have the sun. So we now accomplish this with an electric futon warmer, which is essentially a bag of hot air inserted between the top and bottom futon. Then I take it outside and whack it but it still doesn’t smell of the sun. I’m actually thinking of putting them out on a fence in the public park right outside our house. It might be scandalous but I so miss the smell of the sun. Karen Kingston is the world's leading authority on space clearing and a leading expert in clutter clearing. Her first book, Creating Sacred Space with Feng Shui, has sold over one million copies in 16 languages, and her second book, Clear Your Clutter with Feng Shui, has sold over two million copies in 26 languages. This entry was posted in Space clearing skills. Bookmark the permalink. Practical Question: Is it cushy enough to be comfy? For those with achy bones? And more to the point – don’t the futons slide around on top of each other? Especially with the bag of hot air between them? I am such a restless sleeper. I move around a LOT. And if I am considering a romantic night I wonder where everything would wind up in the morning. This is a serious question – am looking for help for a friend who hates sheets on her bed – would rather sleep on a bare mattress with a light cover over her. Sounds odd but she really HATES sheets. However she would like to save her mattress and – uh hem – would like something presentable in case she has a guest. Japanese futons are very different to western ones. In the West they are made in one piece and are every bit as solid as a spring mattress to sleep on. There are some superbly comfortable ones available these days and because they have no metal springs inside, they are a much healthier option. 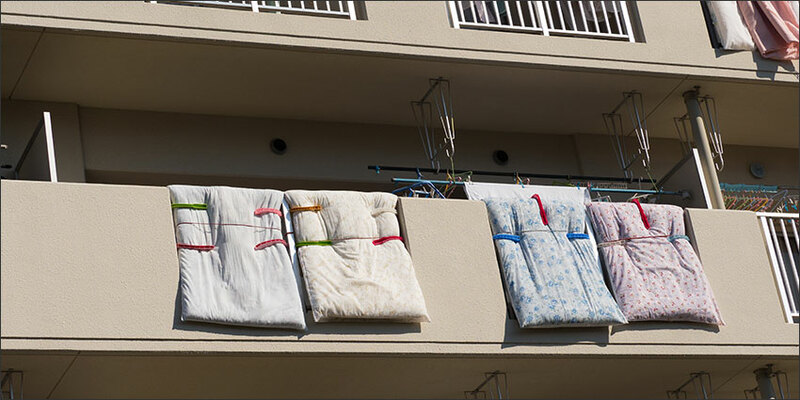 In Japan a hot air bag is sometimes used to air futons, but it is removed before sleeping. As to your friend who doesn’t like sleeping on sheets, I suggest she experiments with different fabrics to find something that suits. We excrete substantial amounts of physical and etheric debris during sleep so her mattress must be getting pretty cruddy by now. Sleeping like this all the time is sure to affect her health and wellbeing.